Jewelry boxes have long been treasured, for they have held precious items—sometimes valuable in themselves, sometimes valuable for their memories. Throughout history, jewelry boxes were constructed and designed by craftsmen, one box at a time, each a unique piece reflecting the style of the time and locale. With the advent of the Industrial Revolution, all this changed. As we know, the concept of mass production was avidly adopted in the United States during the late 19Th early 20Th centuries. And for the first time, metal objects like jewelry boxes, for example, could be cast in quantity and, therefore, were less costly to produce. American ladies of the early 1900’s aspired to the “high style” of the world’s great cities like London and Paris. Mail order catalogs--Sears and Roebuck, Montgomery Ward, and Marshall Field--enabled the American family to peruse the products, jewelry boxes among them, and make purchases from their own homes. Of course, jewelry stores also carried a selection of jewelry boxes, “the latest” designs purchased from wholesalers and displayed in their windows. The sale of jewel boxes as souvenirs was another phenomenon. Increased travel to points of interest around the country, combined with a Victorian carry-over desire for trinkets, encouraged travelers to purchase mementos of their journey. Jewel boxes were always a popular selection. 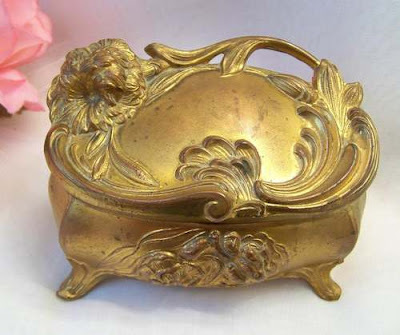 Also called “jewel case,” casket and occasionally trinket box, they were classified as Art Metal Wares and usually made of cast metal, finished—or plated--in gold, silver, copper or ivory. A popular misconception today is that there may have been some iron in the metal. 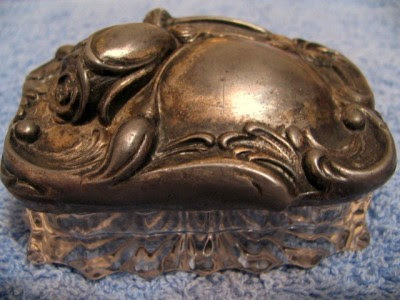 According to an October 1908 article in Jewelers’ Circular—Weekly, the most common base metals for jewel boxes were actually spelter or antimonial lead. 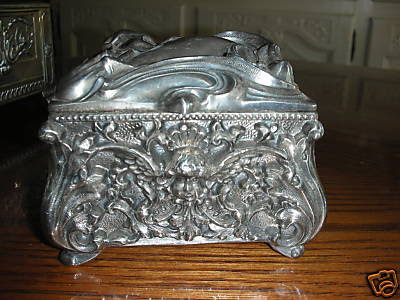 Almost all of the alloys used for jewel boxes were of metals with low melting points (or “soft” metal), thus explaining the weak or broken hinges often seen on jewel boxes today. The most prominent decorative style of jewel box during the early 1900’s, was Art Nouveau--a romantic style noted for its flowing, asymmetrical lines, with motifs relating to nature—flowers and vines, birds, women with flowing hair. While most people today associate Art Nouveau with the graceful “nymph-like” young women, it is important to mention that floral motifs held a major place in the American Nouveau jewelry box world. 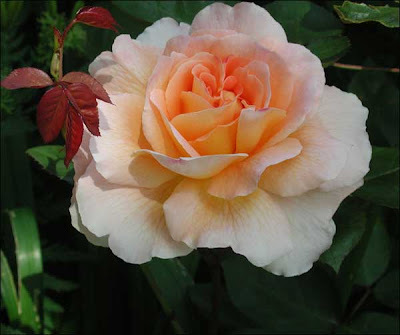 The “language of flowers” had become a particularly popular concept during the Victorian Period. At the turn of the century, these “sentiments” were also reflected in the Art Nouveau style on jewelry boxes: the four-leaf clover for good luck, daisies for innocence, roses for love and beauty, and so on. Other motifs gained favor also. It was a time of great archaeological discoveries. Ancient temples in Egypt and Pompeii were being explored, and those styles were copied. A resurgence of interest in Greek and Roman styles was another source for decorative motifs. And Americans began to reflect on their own history, with a renewed interest in its Colonial days. Many jewel boxes were depictions of pre-Civil War plantation life. Even though these jewel boxes were “mass-produced,” peak production lasted fewer than 15 years (1904-1918). And remember, the term “mass production” during 1900-1910 held a completely different meaning then than that it does today. Fortunately, we can still discover examples of these (almost) 100-year-old decorative treasures. Gold and silver finished boxes are the most common. Regretfully, the silver-finished boxes have not fared well, unless actually silver plate—a rare find. 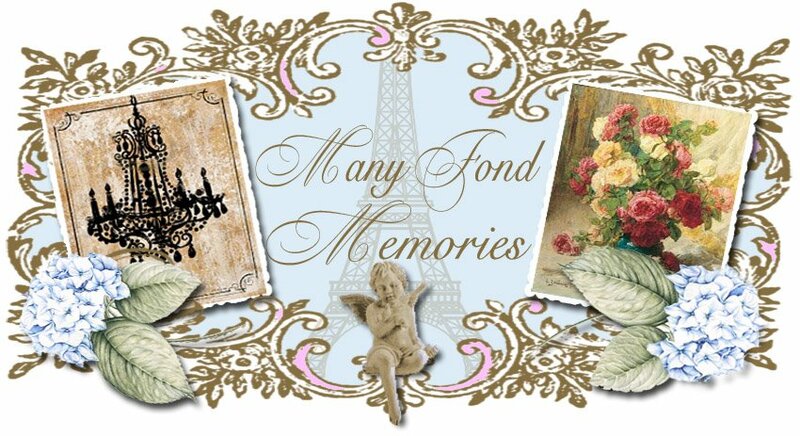 Next most rare are souvenir jewel boxes with commemorative ceramic or photo discs. And the ivory finished boxes, although somewhat later in development, remain elusive. Their enamel finishes were more durable, so they may still be handed down within families. These wonderful antique art metal jewel boxes were much treasured, and they held their popularity well until World War I, when the continuity of fashion was broken, re-directing interest from the decorative to the function and power of the machine. I am looking forward to today. I am meeting up with some friends from High School. It's a blast when we get together. We meet up for lunch and talk for hours about our family and the good ole times. 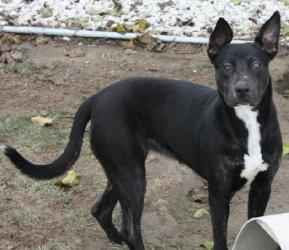 We are going to try and get together at least once a month if possible. Looking forward to it. You could not have asked for better weather. It was in the 70's and everyone was out. It was crowded. I took my girls with me, and their stroller, they got so much attention. People were stopping me so much I could hardly look at things. I could hear them saying from afar, look at those cute puppies in the stroller........men, women, and children. But I did manage to find somethings. A book of poems from Germany, hand written by different people from 1901-1905, what beautiful handwriting they had. A horse ribbon of someone that won third place, a rosary, fabric flowers, and a art nouveau jewelry casket. 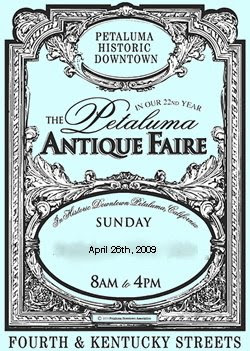 It's that time again for the Petaluma Antique Faire. I am taking my girls and their stroller to see what I can find. It's was suppose to Rain, but the forecast has changed and now it's going to be at least in the mid to high 70's. Petaluma has at lot to offer other than the Faire, so I am going to see what else is around there. 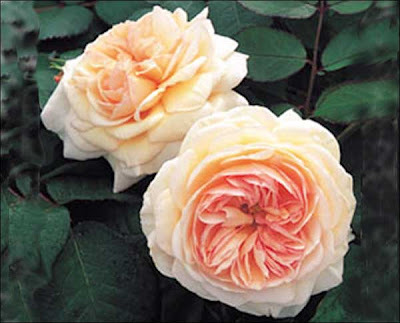 Heirloom Roses, is a great place to order your roses from. I purchased these and they arrived yesterday. I can hardly wait to put them in the ground. I know it will be awhile before I see these beauties produce, but when they do, I know I'll love them. I have purchased from them before and those are doing great. 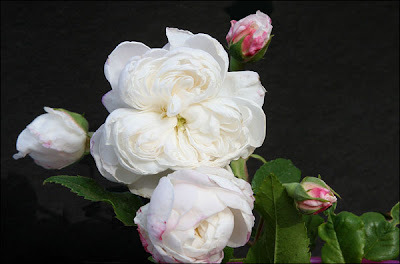 You can find them here on my blog, on a link on the left sidebar, or click on the name and it will get you there too. Of course being down in San Jose, I had to go to Vintage & Vogue. 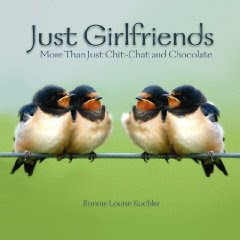 You've seen this featured on Cindy's Blog several months ago. It's a Beautiful Shop with both new and vintage. These pictures do not do it justice. I had to get only just a few things there, otherwise.....I would have been poor leaving. on them can not be faked. So they too came with me. at Vintage & Vogue and could not leave without a few things as well. and then hang your purse on it, rather than on the floor. The tray was something, I have been looking for, for awhile now. The plate is actually a little cake stand. Silver is another weakness so, I could not leave that behind. A cute little plaque and a little glass cloche made their way into my hands as well. I recommend you go if you can, To Move It Elsewhere, in San Jose, CA. You'll find quite a lot of things to choose from. What can I say....Move It Elsewhere in San Jose, is a treasure trove of beautiful things. I did find some wonderful treasures and could not believe my luck on a few things. The great thing was that everything in the store was 50% off, and if it was brown it was 65% off. I went there to meet up with Cindy, from My Romantic Home It's getting to be a habit meeting up with her. She's a lot of fun. 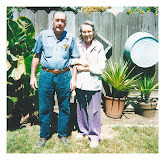 My next stop is Petaluma, CA for the Antique Faire. I'll post my finds tomorrow. I am so excited about both of these finds. This is truly more my style than any other out there. I truly love these. When I go into a shop or flea market I look for this style more that any other. I go for the not so pretty or kinda quirky things. French inspired or English Country. I guess I am true to my Heritage. I am looking forward to this weekend. I'll be meeting up with Cindy, from My Romantic Home to go to Move It Elsewhere, in San Jose for some shopping and a bite to eat. You know what I'll be looking out for, things similar to what are in these books. Please welcome Susan, from Simply Susan. 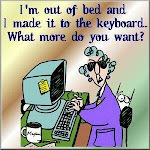 She's new to blogging and we all know how hard it is in the beginning. Stop by and say, Hi !! On the way back we stopped to eat dinner at Harris Ranch in Coalinga, CA. It's an awesome place to stop and eat a nice dinner. They serve more than Beef, so you have choices. 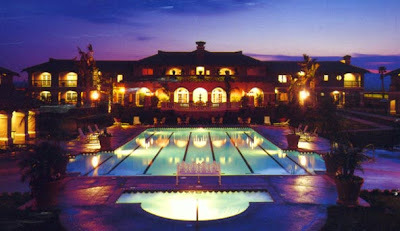 They also have a beautiful spa, and hotel to stay. Our parents home was remodeled and recently re-listed. 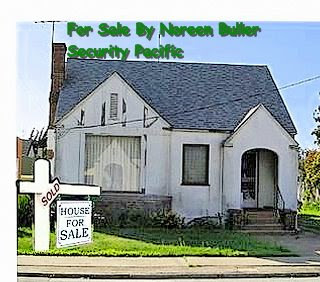 I contacted our listing agent that sold it, and asked if she could take me inside to see what they did. I was impressed with what was done. They persevered the charm that the house always had. He did do some things different, like turning the bathroom around and reconfiguring the kitchen a bit. 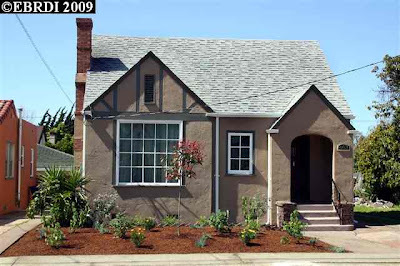 Overall, I was very happy that he was keeping with houses original moldings and wood flooring. Repaint and re-texturing of the walls was done as well. 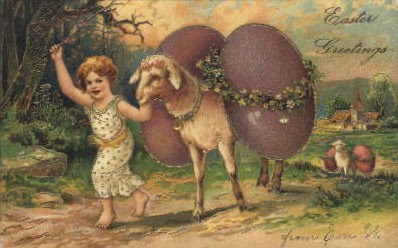 Hope everyone has a wonderful and fun Easter. 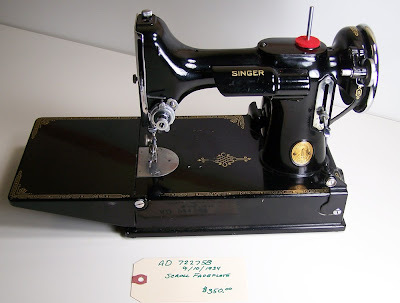 My little Singer Featherweight is sick and in the Sewing Machine hospital. I am sad. Their great little machines. Hard working and very popular. Quilters love these little babies. They are handy to take anywhere. Ladies simply packed them up in their carrying case and took them with them to other ladies homes for quilting. They don't do the fancy stitches, just straight and that's fine for me. I am not a big sewer and it suites my needs. I thought I'd give you a little history on this fabulous machine. Production of the 221 started in the UK at what was then Singer's largest factory in 1949. Six years later production started on the ultimate Featherweight, the 222 Freearm, and then the white/green model which was made in very limited numbers until 1964. Tan/beige machines were also produced in Scotland and at the Canadian plant. The new design was introduced to the public in 1933 at the Chicago World's Fair. The improved model, which followed three years later, had a re-worked bobbin case and a numbered dial which took the guesswork out of tension setting.